Invading Iran is out of the question. The mountainous geography of Iran, a nation of about 70 million people, makes direct occupation impossible given available American forces. An air campaign against Iran’s conventional forces would play to American military strengths, but it has two problems. First, it would be an extended campaign, one lasting months. Iran’s capabilities are large and dispersed, and as seen in Desert Storm and Kosovo against weaker opponents, such operations take a long time and are not guaranteed to be effective. Second, the Iranians have counters. 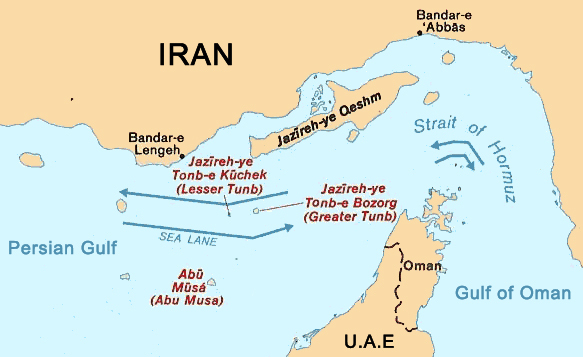 One, of course, is the Strait of Hormuz. The second is the use of its special operations forces and allies in and out of the region to conduct terrorist attacks. An extended air campaign coupled with terrorist attacks could increase distrust of American power rather than increase it among U.S. allies, to say nothing of the question of whether Washington could sustain political support in a coalition or within the United States itself. Presence of mines in the Strait would drive maritime insurance rates through the roof. Neither the U.S. nor Iran stands to gain from this scenario. Even the closing of the Strait of Hormuz presents a lose-lose situation, and this fact does not escape the calculations of either side. A 2,700 kg solution to most any problem. Which is why a covert war, writ large, currently rages in Iran. 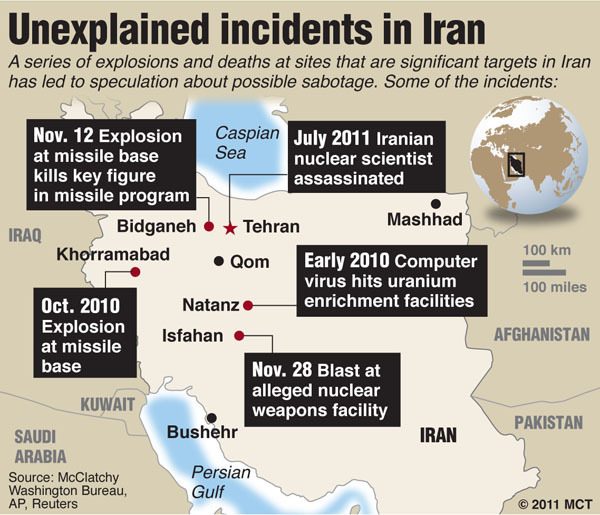 Though blown out of proportion, the concern about a nuclear Iran is real, and becomes more so when war is not imminent. Instead of the simple methods of “Big Blu” (see image), more sophisticated methods will be necessary. 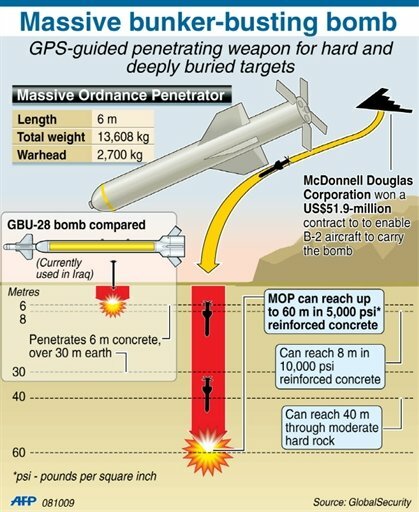 Much like Iran’s nuclear program, the war will be protracted and moved underground. Fortunately for the U.S., Iran is—by most estimates—still lacking properly enriched fissile material. At this stage, a sprinkling of diplomacy and sabotage can still stall the emergence of a nuclear Iran. Unforgiving sabotage—that is—which is how one would instinctively explain the recent assassination of Mostafa Ahmadi Roshan, “a 32-year-old chemistry expert from Tehran’s Sharif University who held the position of a deputy director for commercial affairs at Natanz nuclear plant in central Iran.” But, as many have maintained, this kind of sabotage-terrorism serves no real purpose in stalling Iran’s nuclear program—Iran’s human resources being much too extensive to thwart. Put simply, this guy wasn’t that important. Iran says as the UN Resolution 1747, adopted against Tehran in March 2007, cited Abbasi’s name as a “nuclear scientist,” the perpetrators were in a position to trace their victim. But the assassination of Roshan was met by immediate condemnation from the U.S. and the cancellation of the scheduled “Austere Challenge 12” cooperative wargames with Israel (here). The postponement of a massive joint United States-Israeli military exercise appears to be the culmination of a series of events that has impelled the Barack Obama administration to put more distance between the United States and aggressive Israeli policies toward Iran. But why would Israel feel that it has to “push” the U.S. into a conflict by assassinating these scientists? After all, there seems to be at least some level of cooperation between the two against Iranian ambition. To understand Israel’s recent unilateral action, we have to look back to where President Obama was on the night of the 31st of December and what he did with the stroke of a pen. An EA source reports that a relative in Tehran ordered a washing machine for 400,000 Toman (about $240) this week. When he went to the shop the next day, he was told that — amidst the currency crisis and rising import costs — the price was now 800,000 Toman (about $480). We are left to understand the sanctions for what they really are: An attempt to annihilate the rial. Iran’s only alternative to the rial—or so the U.S. hopes—will be the dollar (it certainly won’t be the Euro). Being that Iran has been notorious for its evasion of the dollar (the IOB, for example), the “dollarization” of Iran—an oil-producing country—would be a significant victory for the United States over Iran and its crude-thirsty customers (who have been drawing up oil deals in their own currencies instead, evading American seigniorage). Indeed, several reports suggest that rials and hard assets have been traded for dollars by concerned Iranians as the rial predictably hyperinflates. But all of this could only be considered a victory if Iran continues to export its own oil in the long run. The answer is simple: The U.S. does not see a war on the horizon. Nor does it see a fallen Iranian regime. If anything, it sees an assertive, opportunist Iran edging out some of the GCC’s petroleum market share and gumming up the works in the Arabian peninsula. If nothing else, it sees this as a very real possibility. With Iranian influence potentially dominant in the new Iraq and the old Syria, the U.S. is in need of a hedge against a new Iran and a new oil empire. While this all may be the “worst scenario” in President Obama’s mind, it’s still a scenario, and it has prompted a currency war for the U.S.’s economic security. This has, in turn, miffed the Israelis, who have caught on and responded by attempting to drag the U.S. and Iran into a military confrontation. All three parties know the consequences of a war, which would send Iran back to the stone age, the U.S.—and the world— into recession, and Israel into a state of… well… relative comfort. You can rest assured that these considerations have been carefully weighed by each country. But don’t let that deceive you: The outcome doesn’t have to reflect any careful considerations—which is why the 5th AOR will be occupied by three U.S. carrier strike groups in the coming weeks.